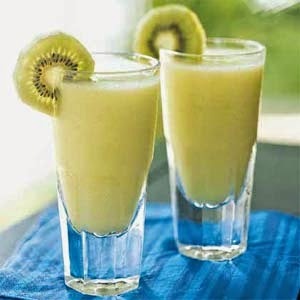 In the container of an electri lbender, combine kiwifruit, rum, liqueur, cream of coconut. Pineapple, and 3 cups ice. Process until smooth. Into a pitcher, pour mixture through a fine wire mesh strainer, discard solids. Divide evenly among 4 glasses. Garnish with kiwifruit slices. If desired. Serve immediately. Prepare recipe as directed ,substituting about ½ cup pineapple juice for rum and liqueur.